What a joy Fiasco is. My first game of it was at GenCon with some close friends and I fell in love immediately. A huge lover of the Coen’s brothers films that the system attempts to recreate, I just love this system so very very much. Ideas for new playsets jumped around in my head for a while before I realized just how fluid the system is and how effortless it is to translate idea to concept, not to mention how damned fun it is to write in the setting. The first one I made was inspired by a great twitter thread and was in many ways one of my early leg ups in the RPG scene. One of the other great strengths of Fiasco is that it’s standard design gives me a lot of room to make some of the best art I’ve done, in my opinion. Minimalism is a lot of fun! Before you is a corpse. This person was a friend, a stranger, a father, a mother, a wife, a husband, but now they are dead, and the killer is among you. You, and the people around you are trapped in some remote location, maybe it’s a train, or a remote ski lodge, perhaps you’re locked in the parlor room or a steamer headed for Greenland, regardless, you’re not going anywhere, and neither are the suspects. Luckily, one of you is a legendary detective, known the world over for their uncanny ability to pick away at a mystery until the truth is all that remains. Find the killer among you; discover what happened to the deceased and try your very best to not share their fate…unless of course, you’re the murderer. Then your job is much easier – Don’t get caught. You and your friends awake in a world where nothing works as it should, you can’t seem to do anything right, and strange haunted figures shadow your every move, muttering endless slogans and pitches. Find the way out, or stay and make this place your home. Stumble your way to survival or join the monsters for the low low price of your enternal soul. 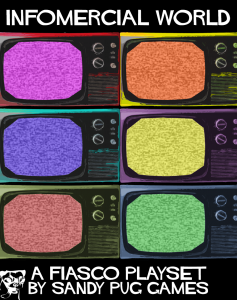 Infomercial World is a horror comedy Fiasco playset set in the terrifying, hilarious, semi-black and white world of Infomercials. 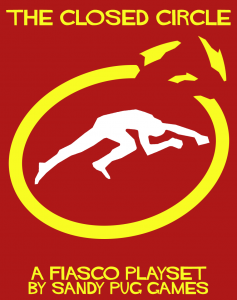 It requires the Fiasco RPG core book to play. After an eternity of campaigning, dozens of debates, hundreds of promises, thousands of tour stops and millions of voters, the unimaginable happened, and now you and yours have won the White House. Sure, there’s allegations of tampering, of collusion with foreign agents, and before your guy is even in the seat, the streets are swollen with protests, people are setting fire to trash cans and it kinda looks like Nazis are making a comeback. But ignore that for now, you’ve wormed your way into the left hand of the most powerful man in the world, and it’s time to take advantage of that. Exploit your position, get everything you can and get out before the ship burns to the ground. Or hell, see if you can bail the water fast enough to keep it afloat till the end of the term, stranger things have happened. Or undermine the whole rotten system and destroy it from within. 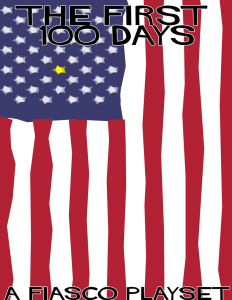 Whatever you do, it’s going to be a crazy 100 days.